Oliver, Okanagan Valley, British Columbia, CanadaIt’s been a decade since I have seen this wine, which is a shame, since it's likely the best bottle of wine I have tasted from Township 7. Aromatic and fresh with peppery undertones, there is an inviting black fruit with fresh pepper and liquorice throughout. It’s the elegance that attracts, along with the meaty, truffle, peppery aftertaste. It spent 24 months in 50 percent new French and American barriques, including a single puncheon to breathe further style into the wine. Frankly, it seems worthy of all French oak, but I leave those details to the winemaker. Grilled or roasted beef is the match. The fruit is mid-valley Skaha Lake from the west facing rocky soils of Silver Barrel Vineyard. 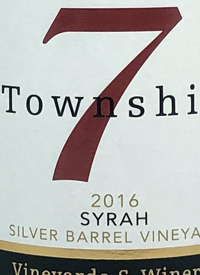 Only 298 cases were made.Tasted: 19 March 2019Tasted by: Anthony GismondiPrices: BC	35.97	sold out Producer: Township 7 Vineyards and WineriesDistributors: Renaissance Wine Merchants Ltd.